Working on a sloper that I draped on a dress form. The class turned out even better than expected. The tempo is brisk and the level is much higher than the basic pattern making class I took a year ago. 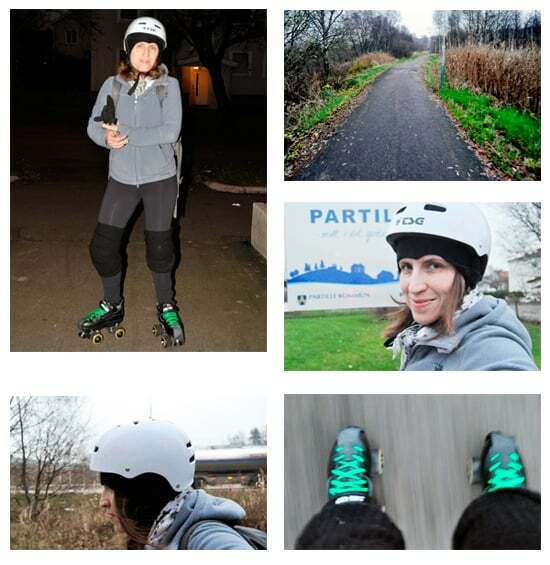 I was also a bit surprised when I realized that I’m just about the only one who is a hobby sewer/drafter. 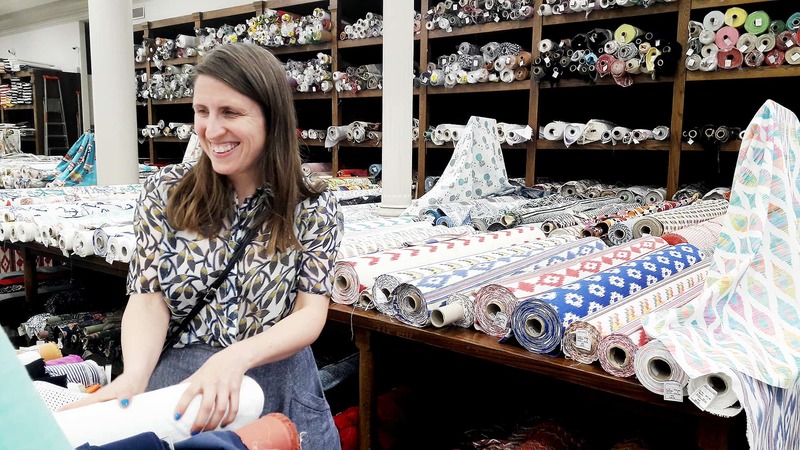 The rest are either professionals (like costume designers, pattern makers and teachers) or design students. That made me a feel a little self conscious at first (and compelled me to blurt out ” but I do sew a lot” during the presentation). Though I’m not the brightest or fastest kid on the block, I still find that I can keep up pretty well during the class. 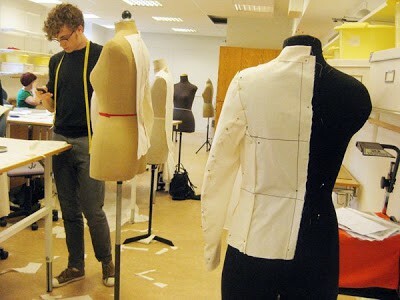 The teacher is Rickard Lindqvist, a local designer specializing in tailored styles with innovative cuts. 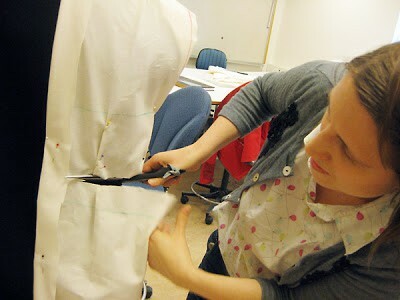 The first day we learned how to make patterns out of finished garments and how to grade them in different sizes. I traced one of his pants from the spring/summer collection. 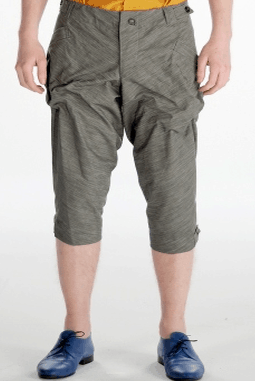 The style is based on an ancient pair of riding pants and the pattern is just one big piece. Day number two we used historical patterns from reference books and sewed up muslins. I did an evening gown based on a pattern from Madame Vionnet. This was also my first encounter with an industrial sewing machine – I was shocked by how fast they are, it was a rather scary experience if you ask me, but the other students praised the machines. The dress is adapted from a diagram in the Japanese book Vionnet. The pattern is also available in Betty Kirke’s book Madeleine Vionnet, but the diagrams are much clearer in the Japanese book. Today we have draped patterns straight on a dress form, another first for me. It was easier than I thought, but I still had to fiddle a lot to get the muslin pieces to look decent. Although Karl Lagerfeld won’t be calling for my services anytime soon, I’m still pretty proud that I managed to drape a blazer straight on a dress form without any prior experience. A back view of the blazer. 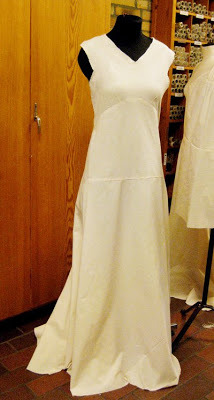 The only thing that isn’t draped are the sleeves (we used a flat pattern for that). Now I have only two days left, and I feel a little sad thinking about it. Right now this feels like the best class I have ever taken, I don’t think I ever have learned so much in so little time before. You have knocked my socks off! The blazer looks great, but then again so does the dress. And the pants you copied? Fantastic. I know we only know each other from across lots of sea and land (which means we barely know each other) but I feel compelled to say… I'm very proud of you! What an accomplishment to be part of such a class. Obv. it was the right place and the right time for your talent. Brava! That blazer looks very professional. I am jealous – it sounds like a wonderful class, and I'm sure you have really stretched your skills. Your muslins are very impressive looking! Amazing! Good for you! You must feel like a million right about now, and well deserved. I am amazed at how much you are doing! Sounds like a great class. This class looks amazing – as do your designs. The dress is fabulous. And the blazer…WOW! congratulations. I've given you the "One Lovely Blog" award. You can pick it up at my blog http://pendlestitches.wordpress.com/. I don't even know where to start. 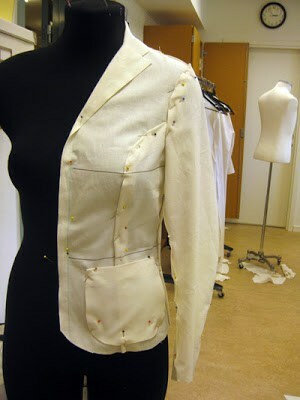 Draping a princess seam blazer? A Vionnet gown? You have covered so much ground in that class. What a great way to challenge yourself. I am beyond jealous that you have such wonderful classes available to you. You draped a blazer! Wow. The evening dress is pretty fabulous too. I was impressed with your ability to draft your own patterns before, but this really opens up a whole other world. I really am looking forward to what you turn out after this class.